Activlab Beta-Alanine is a dietary supplement in capsule form which is aimed at increasing the body’s performance and reducing fatigue. Because of that, it is a valuable product for every athlete. One capsule contains 4g of beta-alanine, which accounts for about 50% of the maximum recommended daily dose of this ingredient and has clinically proven efficacy. 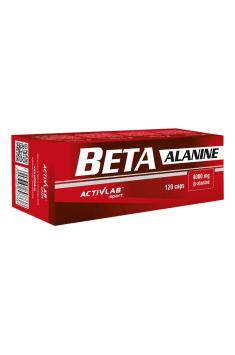 Beta-alanine is an organic chemical compound from a group of amino acids. Even though it is not incorporated into proteins, it is very essential to strength, speed and endurance athletes. Beta-alanine is important for physical fitness primarily because it is a precursor to the dipeptide carnosine. This means that it cannot be synthesised without this compound and has a very useful function in our muscles. Carnosine prevents the decrease in pH which occurs in muscle tissue during physical activity. In others words, it helps maintain the body’s acid-base balance, thereby inhibiting post-workout lactic acid production. Unfortunately, beta-alanine is very rarely found in nature. Admittedly, it is present in foods such as meat, eggs, dairy products, nuts and beans, i.e typical protein products. However, these amounts are very small and thus doesn’t have practically any impact on body functions. Higher beta-alanine levels mean higher carnosine levels. Because of that every athlete, regardless of sport, will enjoy their benefits. Slow production of lactic acid in muscles increases their efficiency and reduces fatigue. This is because lactic acid disturbs the transmission of nerve impulses in muscles and impairs their contractility, thereby causing pain, which warns us that we shouldn’t put more strain on them. The less lactic acid build-up, the better nutrient delivery to muscles. Increased carnosine intake also reduces the risk of extensive damage to muscle fibres. According to studies, athletes taking regularly beta-alanine noticed a difference in their performance after a week. Muscle efficiency in subjects increased by an average of 13% after 4 weeks and 10% after 10 weeks. It was also accompanied by around a 50% increase in carnosine levels. Beta-alanine is also required for the synthesis of coenzyme A which is involved in fat oxidation and thus inhibits the accumulation of body fat and speeds up metabolism. In addition, it promotes tissue collagen synthesis and therefore increases the elasticity of joints and tendons and prevents their injuries. According to some studies, carnosine levels in the majority of the population decreased in general, which may be associated with a stressful lifestyle and chronic tension of muscles due to inactivity. This may cause premature ageing. It was shown that increased intake of beta-alanine and carnosine in some examined individuals could be correlated with better quality of the skin, hair and nails. To sum up, Activlab Beta-Alanine is a supplement which significantly increases the efficiency of muscles during a workout and aids their recovery after training. Higher carnosine levels make it easier to gain muscle mass and contributes to improving endurance and precision of movement. In addition, it aids muscle contractions and helps you avoid muscle soreness. Take 4 capsules before workout. Beta-alanine is neither a pre-workout formulation nor a post-workout supplement. In order to enjoy its benefits, you have to maintain its high levels in the body. Because of that, the perfect solution is to take it a few times a day in small doses, regardless of your workout time. Beta-alanine works well with creatine. If you train to build muscles, it is therefore recommended to take both substances or use them interchangeably to obtain better results. Beta-alanine administration may cause the so-called paresthesia, i.e. a tingling sensation in different parts of the body, most frequently on the skin of the face and hand. This is associated with the activation of sensory nerve receptors in the skin and means that the single dose was too high rather than the supplement should be taken on demand. Apart from this tingling sensation, studies does not show any other side effects of beta-alanine, which is considered therefore a safe product. It is worth noting that the current studies have been conducted only for the first few months of supplementation. Because of that, one cannot exclude the posssibility of dangerous complications after a couple years of use. Anti-caking agent: magnesium salts of fatty acids, capsule (gelatin, pigment: titanium dioxide).